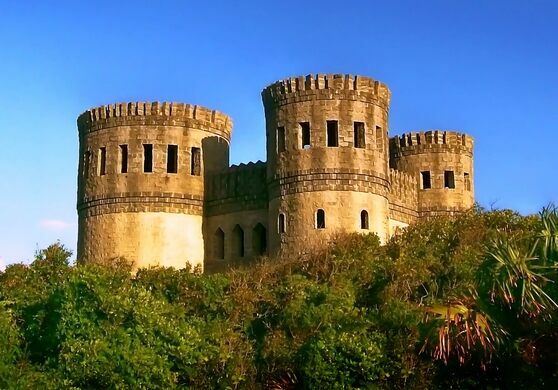 Castle Otttis (yes, three ‘t’s) was built by Ottis Sadler and Rusty Ickes between 1984 and 1988. Based on Irish castles from 1,000 years ago, it was designed to be a landscape sculpture, open to the elements and rising up more than 50 feet. 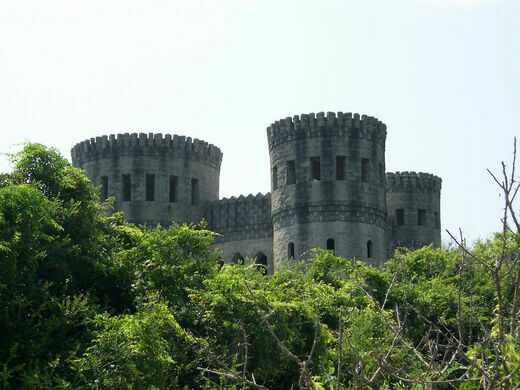 When Sadler and Ickes began work on the castle, it was never intended to be a residence or a business. Their ultimate aim was to create a work of art, one that would invoke the spirit of an old Irish abbey or Christian church. The two men took care of all the masonry themselves with no additional paid labor. And once they had built the walls high enough to be noticed with ease, they were told they needed a construction permit. Due to a clerical error, the building was accidentally officially designated as a garage, albeit a garage built of split-face concrete blocks, reinforced steel rods and poured concrete weighing an estimated 7 million pounds. With ramparts. 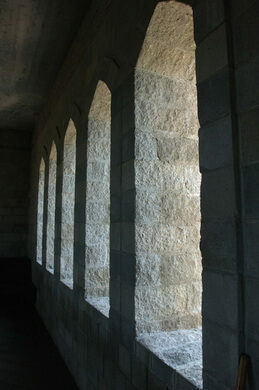 And 88 window openings, left without glass to allow the elements into the castle. In other words, not your average garage. 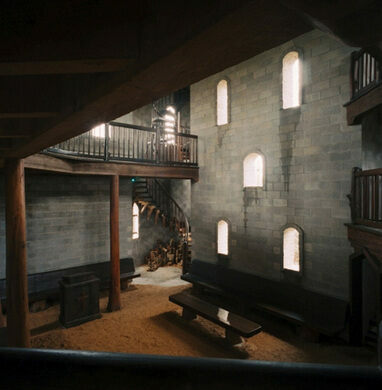 Once they had completed the main structure of the castle, work began on the interior. 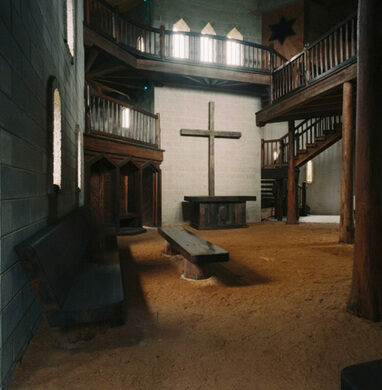 This was handled by one man, Lee Carpenter, who took three years to complete all the interior woodwork, mainly working with cypress wood and some old southern heart-pine. 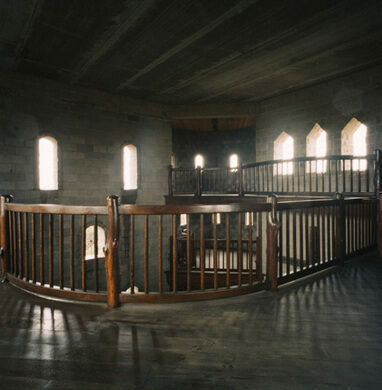 Between 1988 and 1991, Carpenter built eight elaborate staircases, an altar, a pulpit, a series of pews, a choir loft and a bishop’s chair. The final result: a majestic stone castle built as an expression of artistic and spiritual devotion. And, of, course, an impressive new landmark along the St. Augustine shoreline, one officially recognized by the American Institute of Architects in 1992. 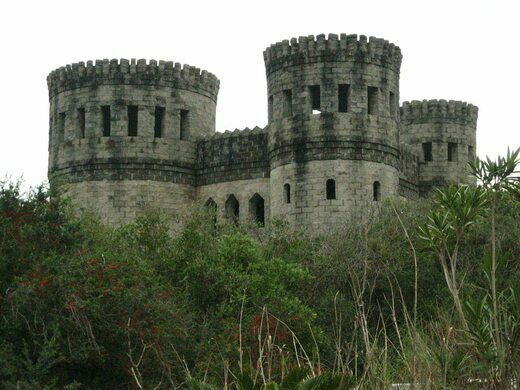 Castle Otttis is located on highway A1A three miles north of St. Augustine, Florida. It’s privately owned and has no formal connection with any group or organization. It does host a public interdenominational Christian worship service on the last Sunday of each month. Visiting the castle is by appointment only, whether it’s for school trips, wedding ceremonies or private tours. The castle is not accessible for those with physical handicaps. There are many stairs on the property. Email Rusty Ickes at rusty@ castleotttis.com if interested in a private tour or event. It's a pretty creepy lock-up. Arrr! The most authentic collection of pirate artifacts in the world... matey. A mysterious carving from 17th-century London seemingly depicts a young boy sitting on a bread basket.